This continues our series learning about Jesus. This is week 4 in the fourth quarter of a year of Preschool Bible Study that I assist with on Wednesday evening. This week we reviewed the Wise Men visiting Jesus and studied Jesus staying behind in the temple. The scripture is Luke 2:41-52. Mary, Joseph & Jesus live in Nazareth and Jesus is 12 years old now. As Jesus grew up, the Bible tells us He became stronger in spirit and was filled with wisdom. 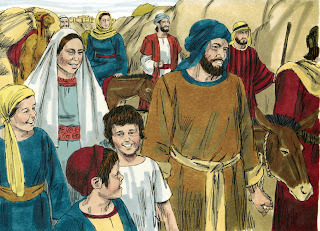 (Luke 2:40) Joseph & Mary went to Jerusalem every year to celebrate the Passover. The Passover was a special time of worship to remember God taking care of His people. They traveled with a group of people. 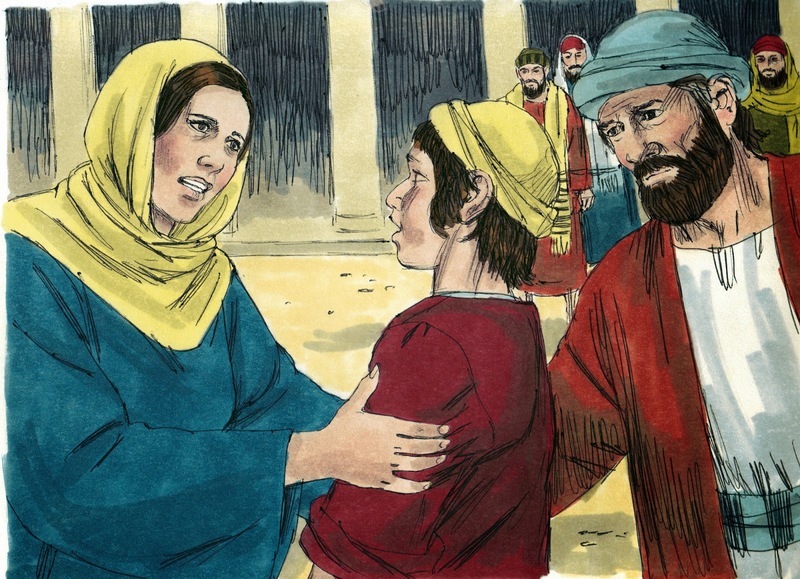 When Joseph & Mary had completed their worship in the temple, they left Jerusalem to return home. But Jesus had stayed behind and they didn’t know Jesus wasn’t with them! Mary and Joseph started looking for Jesus after a day of traveling. 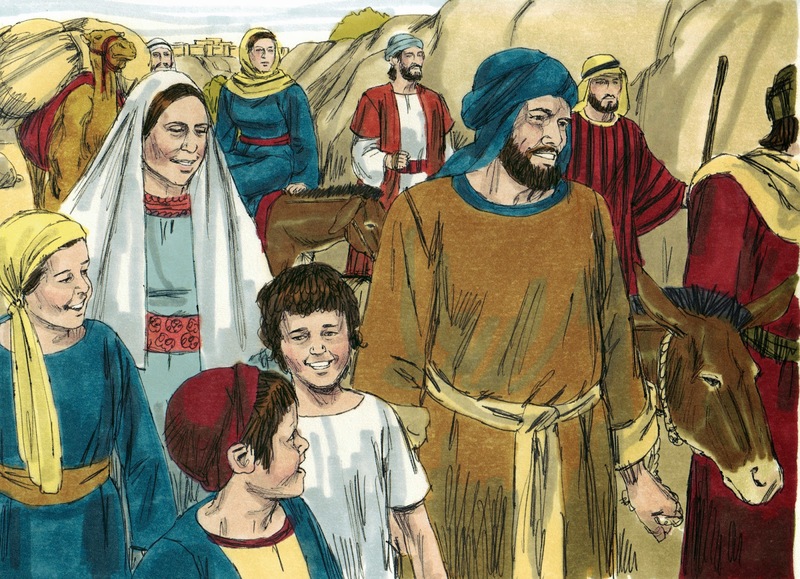 They asked their relatives and friends if they had seen Jesus. Mary & Joseph couldn’t find Jesus anywhere! Finally, after 3 days of searching for Jesus, they found Him in the temple. Jesus was sitting with the teachers! Jesus was asking questions and listening to their answers. When Joseph & Mary found Him, they were amazed that He was calmly sitting there while they were frantically looking for Him! They asked Jesus why He had done this! Jesus answered them saying 'Why are you looking for Me? Don't you know that I would be doing God’s work? (vs. 49) Mary & Joseph were so happy to find Jesus safe! Mary, Joseph & Jesus left Jerusalem to return home to Nazareth where Jesus continued to grow up. The students love these foldables. Print both sides, then fold as you see above. The 'doors' to the temple will open and Jesus is inside with the temple priests. This includes the color and black and white. Click here to download. The printable for this lesson is a Bible Review book. It is a great project for this lesson since Jesus was studying at the temple. If you want to use the above for handouts, this would be good to make one for the teacher to review. There are several ways to put them together, depending on how much time you have. Jesus would have been studying the Old Laws and people, so we used this to match the people to what they did in the Bible. This is a great discussion starter. Click here to find the download and different instructions for putting it together and how to use it. Yes, here is another map! But, they love them, so I made this one to review the family traveling to the temple, I covered up Jesus with my finger for Mary & Joseph to begin their trip home, then back to find Jesus, then they all return home. This includes the color and the black & white to print. Click here to download the map. You can print the lesson with a review of last week here. Click here to see early elementary ideas and printables for this lesson, including a song. Click here for more preschool Jesus at the temple ideas and printables. Hello! I’m having a problem printing the foldable printable for Jesus stays in the temple lesson. Page 5 of the pdf takes up the whole page. Is there an easy fix to reduce the size of the image, for that page, for the foldable activity to work properly? Eve, sorry, I just saw your comment. You should be able to change the print size in your printer settings if you need to print it smaller. That is the only way I know to change the sizing. Thanks for stopping by. I am trying to use the "Jesus Left Behind at the Temple" foldable, but the outside doesn't match the inside in size. Am I doing something wrong, or is there a way to change the size of one of them. Hi, Kathie, I just re-downloaded it and didn't have a problem. The inside is full page. The 'front' page opens like double doors and the back does not have a design since it will lay on the table and mostly not be seen. I'm sorry, but I don't know how I could change it to make it work better.